The price is $20.00, which includes tax, shipping and handling. Be sure to include your return address. For more information call the church at (509) 682-2851. If These Logs Could Talk… Born in Chelan and baptized at St. Andrew’s, Liz Perry was raised in Seattle and came back to Chelan in 1988. Although she wished she had decided to start writing in college, her writing journey began when she started working on her first book and the expansion of her family history. She has been working on a new project recently, a book about the history of St. Andrew’s. 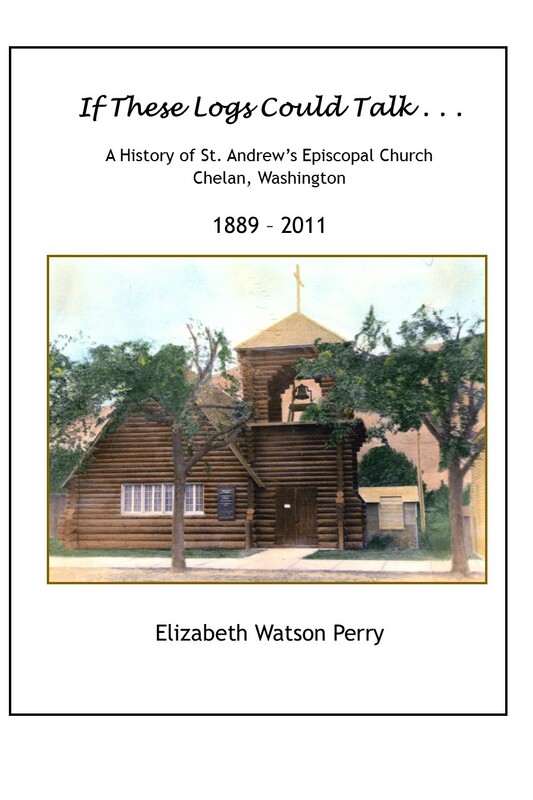 Titled “If These Logs Could Talk”, it has been an adventure for Liz, researching the people and events that have built the church she has loved all her life. I asked Liz some questions about her book, and she gave us some insight to her inspiration and development process. Q. How would you describe your book? What is it about and what do you hope people can learn from it? A. It is a story of the people and events that have led to the congregation and church building as it is today, and the realization that we all leave an "imprint" while we’re here. A. My inspiration came from Tom Taxelius and the short history of St. Andrew's that he wrote for the 100th anniversary of the church in 1995. It seemed to me that more stories needed to be told, and questions were being asked about certain changes to the building that needed to be answered. Q. How long did it take you to complete writing it? A. It took much longer than expected when I began the project about four years ago. The timeline was extended due to family health issues, but there was even good to be found in that because it allowed time for more names to be added along the way. Q. What was the most challenging part of the book to write? A. The research was a lot more fun that the actual writing. It was challenging to put it into a cohesive, factual, readable form. It also was difficult to know when to stop because there is still so much more information that could have been included, but would have delayed the publication further. I believe our 120 years has been basically covered! Q. What is your favorite story in the book? A. I liked the stories that showed a sense of humor; such as the excerpt from Bishop Wyatt's diary, and Rev. Melinda St. Clair's conversation with the man sleeping behind the columbarium. I also really enjoyed telling the story of how St. Andrew's acquired the plans for the church building.